Am-azing beer, how sweeeeet the taste, that saved a lush like meeeee. I once was lost . . . You get the idea. I have been on an IPA mission the last couple of years after I really got into the bitter stuff. First it was Dogfish Head 60 Minute that opened the door. Then, the legendary 90 Minute became a staple. Later, beers like Lagunitas IPA, Stone Ruination, and Harpoon IPA vaulted to the top of the pops. It was like a big IPA piñata burst open, spewing my psyche with hops. Again, you get the idea. So, how was this increasingly hop driven man going to continue loving Belgian style ales after selling his soul at the hop altar? Well, the incredible (and ironically named in terms of this context) Hop Leaf bar in my neighborhood surely helps keep me in touch with my liquid Belgian friend and their yeasty offerings. But, given my increasing love of American microbrews, would a domestic Belgian style really jump up and take notice, smack me around, give me the what for? Ommegang’s Hennepin is a strong contender for best in show as far as U.S. Belgian styles go. North Coast’s Brother Thelonius rates high. 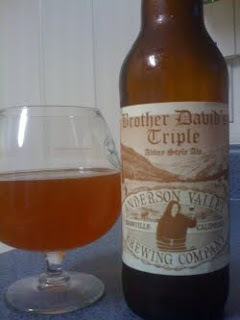 Now, I have to add Anderson Valley’s Brother David’s Triple Abbey Style Ale to the exalted list. This formidable baby pours great, smells great, and tastes very much like the best of Brussels. It has a rich, golden color and pours a large, enticing cumulus head that makes itself at home for a while. It smells of sweet, bright, sharp fruit and has a rich, deep odor profile that’s clean and pure. Immediately the taste hits you. Rich, creamy, malts invade the tongue and linger forever. I get a little peach out of this one but it is well balanced, hardly too sweet. Anderson really delivers with this one, or, should I say, they delivered me from the evils of bad American style Belgians. Was blind, but now I see. Just not straight anymore – hey, it’s ten percent.